I mentioned at the beginning of the month we had a Pasta Buffet party –so fun. For that party I made a marinara sauce and an Alfredo sauce. 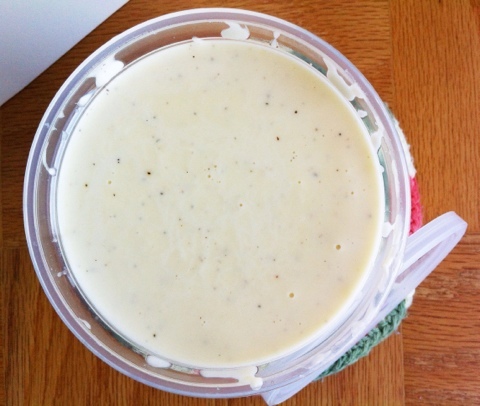 I made a small sauce pan of the Alfredo sauce since according to some research I did, you should make double the amount of marinara than Alfredo since most people will choose the marinara sauce. Obviously these people do not know my friends because pretty much everyone had the Alfredo sauce leaving no leftovers. So I just HAD to make it again, so I could snap some pictures and share the recipe with y’all. This stuff is so so so good. I could seriously pour this stuff in a glass a drink it. I won’t though, my thighs don’t need that. But if you want to I won’t judge you. Promise! This is a simple recipe. No fancy roux making required (making it gluten free!). All you need are the trinity of fats: butter, cream, and cheese. Heaven I tell you. This is one of those “make a little, make a lot” recipes. Just double the amount and mix it up in a larger sauce pan. Done and done. There are a million uses for this sauce. Sure you can put it over pasta. You can also use it as a dipping sauce for pizza, or saturate your steamed vegetables with this stuff and they will sing, you could also put it in a coffee cup and dip a biscuit in it, just to name a few (none of which I tried). I hope you enjoy this decadent sauce as much as I do. Forget buying that fakey stuff in a jar. This takes just minutes to make, it will be done before your pasta is. What is your favorite pasta sauce/topping? I love the combination of marinara and Alfredo together. I used powdered garlic in my recipe since I am a breastfeeding mom and don't want to wreak havoc on my baby's digestive system. If you love garlic I recommend stirring in some roasted garlic into the sauce. Melt butter over medium heat in medium size sauce pan. Once butter is melted add cream heat for 3-4 minutes. Whisk in cheese. Keep stirring until the cheese is melted and the sauce becomes thick. Stir in garlic powder, black pepper, and nutmeg. 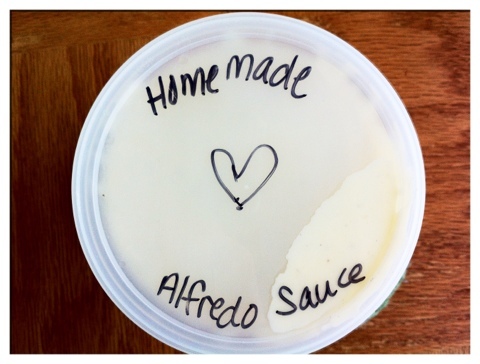 We too love alfredo sauce!